This slow-cooked roast is cooked until it is literally falling apart, making a moist and juicy shredded beef that is perfect by itself or used as a filling for tacos, burritos, tamales, or enchiladas. It is quite versatile, so try it as an ingredient in your non-Mexican dishes, as well! Heat a large saucepan or pot over medium high heat and add the oil. Swirl it around to coat the bottom of the pan or pot. Sprinkle the flour over the piece of beef and rub it in evenly over the surface. Carefully place the meat into the hot pan and let it sizzle for 2 to 3 minutes or until it's browned nicely. The idea is not to cook it, but to sear the outside to seal in the juices. Turn the roast over and sear the other side. If it is thick enough, you can brown the sides as well. Place the beef into a slow cooker. Use a spoon to smear the annatto paste over the top, if using. One at a time, sprinkle on the ground cumin, chile powder, oregano, garlic, cocoa powder, and salt. Pour the chopped green chiles and tomatoes directly from the can over the roast. Add the onion. Cook on low for 7 to 8 hours. After that time, the beef should be fork-tender and fall apart easily. There should be barely any liquid in the bottom of the pot, and what is left should be of a gravy consistency. 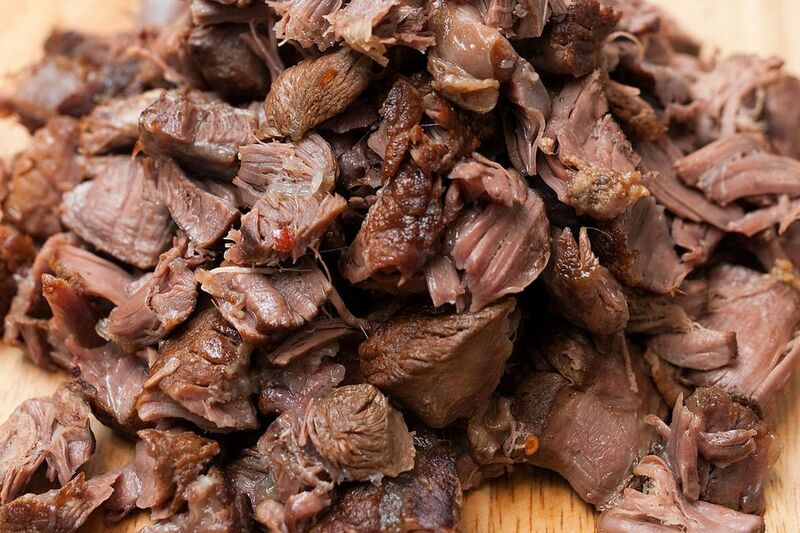 Remove any large chunks of fat from the roast; shred the remaining beef by pulling it apart into chunks or strands. Stir the “gravy” and beef together until well-combined. Serve your moist, delicious shredded beef with a stack of hot tortillas and toppings such as chopped onion, chopped cilantro leaves, a one or more delicious Mexican table sauces. You can easily substitute fresh green chiles for the canned ones, if you like. Roast a large green chile (or two small/medium ones) over an open flame or under a broiler until the skin is blackened. Let it cool and peel the skin off. Cut the stem off; open the chile and scrape out and discard the seeds and veins. Dice the remaining chile flesh and use in the recipe in place of the canned green chiles.